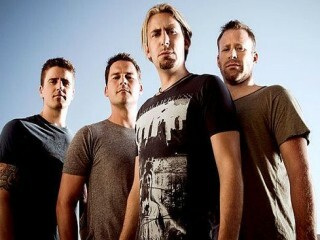 Nickelback is a Canadian rock band from Hanna, Alberta, formed in 1995. Founded by members Chad Kroeger, Mike Kroeger, Ryan Peake and then-drummer Brandon Kroeger. 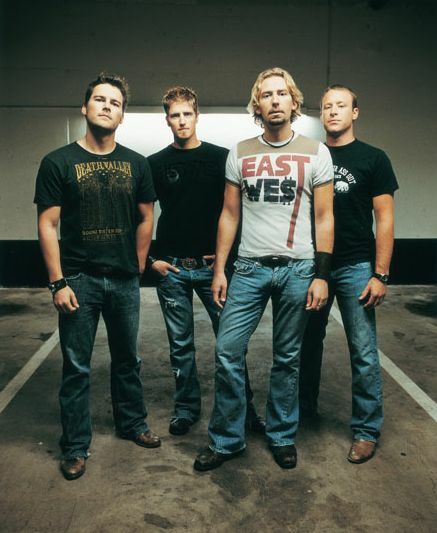 Nickelback is one of the most commercially successful Canadian groups, having sold 30 million records worldwide. Nickelback strikes all the right chords as they once again prove their uncanny knack for crafting catchy songs with unforgettable hooks and indelible lyrical wordplay. Whether it's melodic ballads like "Lullaby,” "Trying Not To Love You" and "Don't Ever Let It End" (an acoustic gem about lovers caught in the “friend zone” that Chad Kroeger calls "very special"), to the metallic roar of "This Means War" and the reckless abandon of grinding rockers like "Gotta Get Me Some" and "Midnight Queen,” the band undeniably has hit a home run with Here and Now. On November 26, 2008, the band announce the tour for the support of the album. While 2011 proved one of the most turbulent years in recent history, Nickelback has emerged rock-steady with an album that both shakes rock and roll to its core while offering a true sense of escapism to their millions of fans across the globe. Traversing the sonic spectrum with a pulsating energy and enthusiasm reflected in the musical diversity, Here and Now is the much-loved Nickelback experience propelled to new levels as the band continues to lure listeners into their trademark party brew of fast-lane indulgences; some tunes tamed by somber reflection while others wickedly embraced with a devilish wink and a smile. With almost 45 million sold worldwide, music fans remain thirsty for the vicarious thrills of Nickelback's newest intoxicating elixir. 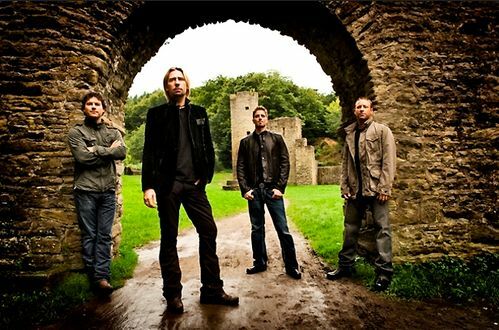 "I think we're very lucky because from the beginning, we never painted ourselves into a corner of saying we're only going to make one kind of music," explains Chad Kroeger, during the final days of recording Here and Now at his Mountain View Studios outside Vancouver. "As a result, we're kind of all over the map with the songs that get accepted by our fans. And that's fantastic, because that means there's always going to be a ton of diversity on all our records." "Because at the end of the day," adds Peake, "people just really like hearing good songs, plain and simple. They like to feel good; whether they're singing along or just listening to it. It's something innate in all of us." So what better way to uncork Here and Now than a double-shot of kickoff singles that toasts the band's enduring potency: "Bottoms Up," a blazing paean to unlimited libations crafted with unmistakable Nickelback hooks and epic chorus, fueled even further by Peake's blistering guitar, Daniel Adair's thunderous drumming and Kroeger's gritty and commanding vocals as the song's raucous ringleader. Guaranteed to become a party staple, "Bottoms Up" will assuredly earn a place in the pantheon of fist-pumping rock classics. 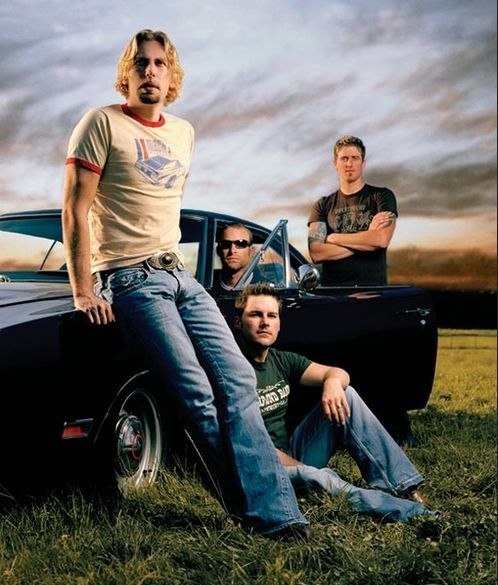 Serving as an equally vibrant mixer is Nickelback's other lead single "When We Stand Together," a decidedly up-tempo anthem that underscores the social conscience still beating in the hearts of those small-town boys from Hanna, Alberta. The highly melodic, foot-stomping anthem belies the more serious underpinnings of lyrics challenging societal apathy as Kroeger sings: "One more depending on a prayer / And we all look away / People pretending everywhere / It's just another day / There's bullets flying through the air / And they still carry on / We watch it happen over there / And then just turn it off." It's a recurring theme that surfaces over the many Nickelback albums - from previous hits like "If Everyone Cared" to "If Today Was Your Last Day" - that Kroeger sees as a way of raising public consciousness, even if in small doses. Not one to commandeer a soapbox, Kroeger is earnest when he explains the genesis of "When We Stand Together" that "we can bring awareness to the fact that we can make the world a better place if we actually just stood together and acted as one world, instead of acting as so many different countries with their own agendas." "It's just so easy for us to see things unfold on TV and then just change the channel," Kroeger continues. "I wanted to draw attention to a couple things in a general sense that might hopefully resonate. And regardless of how 'pop' sounding it may be, I felt the lyrics of 'When We Stand Together' just carried such weight that I needed to offset it with a lighter musical sound. And I think it turned into this really cool balance." Nickelback's phenomenal success quickly attracted the attention of veteran producer Mutt Lange, famed hit-maker, who signed on as producer of 2008's Dark Horse. The band's aptly-titled album showcased their unwavering resolve, racking up over five million digital single sales of hits like "Gotta Be Somebody," "Burn It To The Ground,” "If Today Was Your Last Day," and "This Afternoon” plus more than 52 million video plays over the course of the album's campaign. Dark Horse also fueled a record-breaking two year world tour for Nickelback, who so far have played to well over five million fans across the globe. With 15 radio hits charting at #1 since 2000, Nickelback has earned the unique distinction of being the second best-selling foreign act in America - right beside the Beatles. Not bad for a group of guys who as teens simply dreamed of one day performing "to more than just the steering wheel” as Kroeger so famously sang in his nostalgic confessional "Photograph.” "Geez, I remember playing every night in a cover band in these small clubs and maybe making $300 a week and thinking to myself, 'This is so awesome! What am I going to do with all this money?'" chuckles Kroeger, reflecting on his humble beginnings as a musician. His brother, bassist Mike Kroeger, remembers those early days well. "We would always think, 'God, wouldn't it be cool to play our songs for someone other than just our roommates or family - somewhere where people actually showed up to watch music?' But believe me, none of us as kids were learning how to play the pentatonic scale going, 'Yup, Wembley Arena here we come!" says Kroeger with a huge laugh. "It really wasn't until we got a record deal and then once Silver Side Up did what it did that all of a sudden we were like, 'Okay, we need to start behaving like a world class act and we've got to put together a show that can really entertain people in an arena,’" adds Chad Kroeger, who likens himself to the Master of Ceremonies of a wild private party for over 20,000 of his closest friends every night. "When I'm on stage, I'm definitely in über party mode. I mean, we put on this huge rock and roll show entertaining people, but everyone always says it goes beyond that - it's like this enormous celebration where all these Nickelback fans can get together and really let loose." "I mean, we actually had weekends off, which we didn't on the Dark Horse sessions," continues Adair. "When you're working 14 hour days, 64 days straight, it's just not healthy. It's actually counter-productive. Because in the big picture, you can actually get more accomplished in the same amount of time with a more normal schedule." As the band convened from April through early October 2011, Here and Now's 11 tracks grew organically, according to Peake. "It wasn't calculated at all," he says. "That's why this album is really across the board - from heavy rock and pop-sounding songs, to lighter, more middle-of-the-road songs. We brought a lot of ideas to the table and sussed them out until we were all happy." The smash success of their 2001 album Silver Side Up and its breakout single "How You Remind Me" turned Nickelback into a world class arena act, with Chad Kroeger presiding over a wild private party for over 20,000 of his closest friends every night. The now-classic 2005 album All the Right Reasons insured Nickelback an indelible place in rock history: it spent a staggering 112 consecutive weeks in the Top 30 of the Billboard Top 200, was certified eight-times platinum in the U.S. with more than 11 million copies sold worldwide, and topped the charts in four countries. All the Right Reasons spun off seven multi-format singles and made Nickelback the first band in Nielsen BDS history to send five singles onto the CHR charts: "Savin' Me," "Rockstar," "Photograph," "Fall Away" and "If Everyone Cared." Nickelback's phenomenal success attracted the attention of veteran producer and famed hit-maker Mutt Lange, who signed on as producer of 2008's Dark Horse. The band's aptly-titled album showcased their unwavering resolve, approaching almost eight million digital single sales of hits like "Gotta Be Somebody," "Burn It To The Ground," "If Today Was Your Last Day" and "This Afternoon," plus more than 61 million video plays over the course of the album's campaign. Dark Horse also fueled a record-breaking two-year world tour for Nickelback. "So as long as people want to hear us play, then we'll just keep going," Chad Kroeger states. "And until that day comes, this is the absolute best gig in the world and we'll just keep rolling with the punches."